Argan + Synergy is an all natural 100% blend of precious Moroccan Argan Oil with 4 other amazing oils: Baobab, Kukui, Moringa and Sacha Inci, all selected for their restorative, regenerating and nourishing properties. 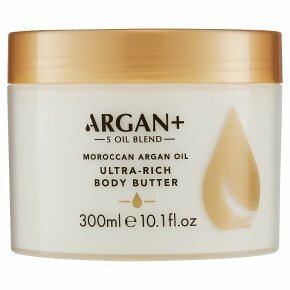 Argan + Ultra Rich Body Butter is the ultimate dry skin savior, combing nourishing Coconut Oil with our unique Argan + synergy, rich in vitamins, omega oils and antioxidants to help boost moisture levels and hydrate skin. Skin is left feeling smoother and conditioned. Directions for use: Massage a generous amount over dry skin after bathing or showering, concentrating on areas prone to dryness such as knees, ankles and elbows. For external use only. Should irritation occur, rinse well and discontinue use. Avoid direct contact with eyes. If product gets into eyes rinse well with water immediately. Due to natural oils, product colour may vary. Avoid contact with clothing as may cause staining.